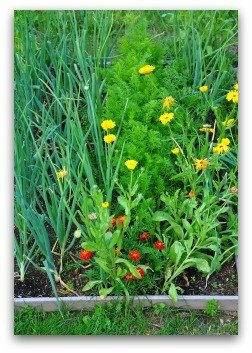 Companion planting of vegetables with herbs and flowers is a great way to have a healthy garden! 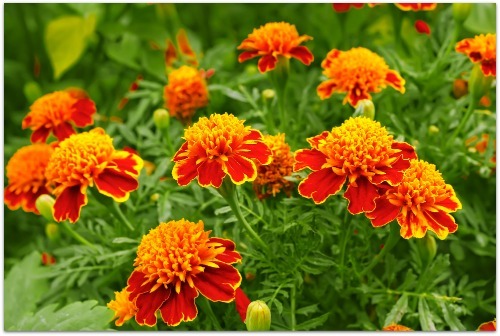 Marigolds, nasturtiums, geraniums, dahlias, and chrysanthemums make great companion plants with your vegetable seeds and can also offer various benefits for your garden. Experienced vegetable gardeners often use flowers shown above, and herbs such as sage, rosemary, basil, and horseradish to act as natural insect repellants in the garden. Learn which plants grow well together, and which plant combinations to avoid for best gardening results. 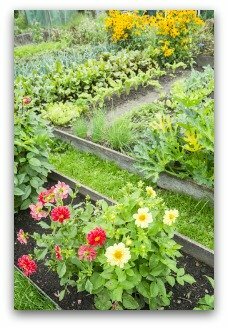 Follow traditional vegetable gardening methods by companion planting your garden. If you desire salad greens to grow in a hot garden, cultivate heat-seeking corn to give shade to the low-lying plants. Radiant sunflowers can be planted to protect cucumbers and members of the cabbage family from the sun. Stake the tall-growing sunflowers and allow cucumbers to climb up their stems. In dry, windy gardens, plant vegetable seeds or seedlings in trenches so the water runs off the soil straight to the plants, and seedlings are protected from the wind. Planting hedges or barriers such as woven willow fences serves as windbreaks. Decorative woven willow or hazel plant can shield plants from wind and lend them support. 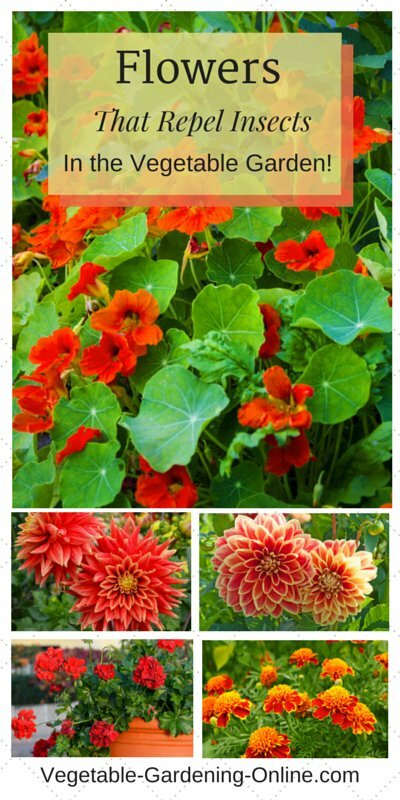 What a perfect way to spice up any vegetable garden; planting colorful flowers near or among the vegetable plants! 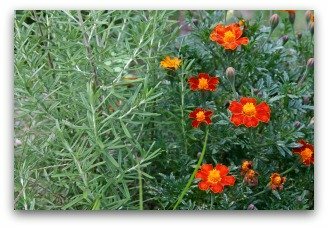 Marigolds, petunias, nasturtiums, chrysanthemums, dahlias, and geraniums all offer some benefits as companion plants to vegetables. 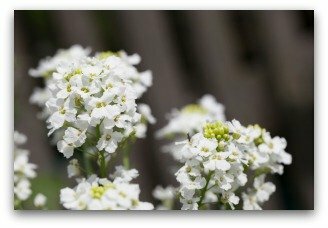 Add any of these flowers to your backyard, raised bed, or container vegetable garden, and you will be thrilled with the results! These flowers are known for repelling garden insect pests, and deterring harmful soil nematodes. An added bonus is that they are all beautiful flowers that will brighten your garden, and distract the eye from dirt or weeds! Russian comfrey is effective mulch for a number of vegetables, and even better when made into liquid fertilizer. 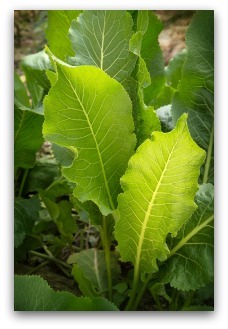 Companion planting of vegetables such as spinach and chard with this healing herb plant is superb for encouraging the vegetables' leaf growth because comfrey is packed with nitrogen, phosphorous, and high levels of potassium. Tests have shown planting the herb to be superior to farm manure for mulching and fertilizing. Companion planting of vegetables with Russian comfrey is known to benefit potatoes, tomatoes, and pepper plants. Bury comfrey leaves in the trench prior to planting potatoes to aid growth. As a liquid, the cultivar is also good for tomatoes and peppers once the flowers have set. Avoid applying it before then, or you will only encourage lush leaves at the expense of producing fruits. Russian comfrey is a vigorous grower and can be harvested several times a season. Another of its benefits is that it tolerates a semi-shady position and is quite attractive. It makes a quality ground cover in the darker corners of your vegetable garden. 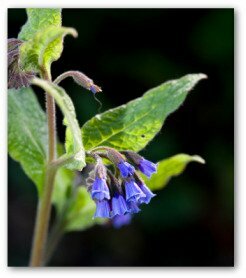 Comfrey can produce an ample supply for up to 25 years. It also attracts bumblebees. If comfrey liquid has one shortcoming, it is that it absolutely stinks! 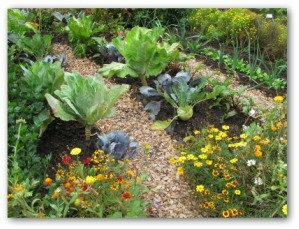 There are many different companion planting vegetable combination's of plants that when grown in close proximity to each other are known to be mutually beneficial. They attract helpful insects or deter unwanted pests. Companion plants offer shade, loosen the soil, or simply enjoy the same growing conditions, which make vegetable gardening tasks more enjoyable for the gardener. 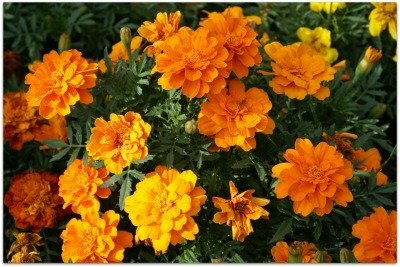 Marigolds are perhaps the best plant friend of the vegetable. They are especially inviting near potatoes, asparagus, tomatoes, and cabbage. Horseradish (yes, it's a vegetable!) is a pleasant neighbor for potatoes, cabbage, mint, parsley, and lavender. On the downside, plant horseradish in a pot nearby or it will rampage through your vegetable plot like there is no tomorrow! Cabbage maggots will happily destroy your crop, if left free to pillage. You can stop the pests in their tracks without resorting to chemicals by adding chopped up rhubarb leaves to the cabbage hole before planting. • Dispose of infested plants. • Do not compost the effected plant debris. • Dust the plants with diatomaceous earth. • Add beneficial nematodes to the soil. • Release predatory beetles into the garden. • Cover plants with row covers. 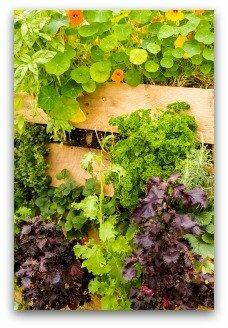 • Solarize infected garden beds, by covering with black plastic which will heat the soil. 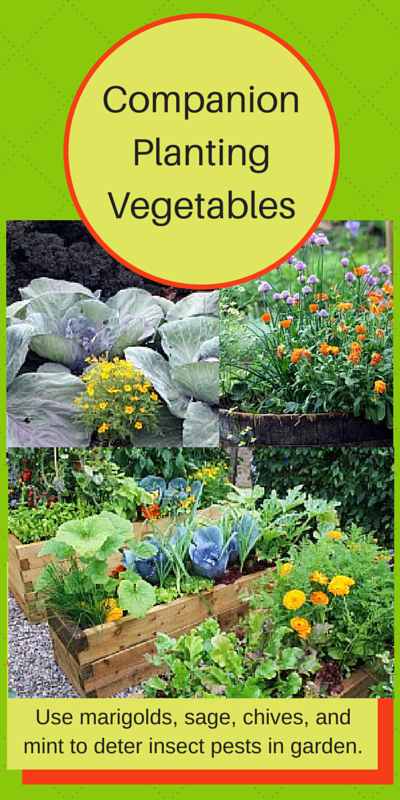 Companion planting of vegetables will also enhance your garden's health and well-being.